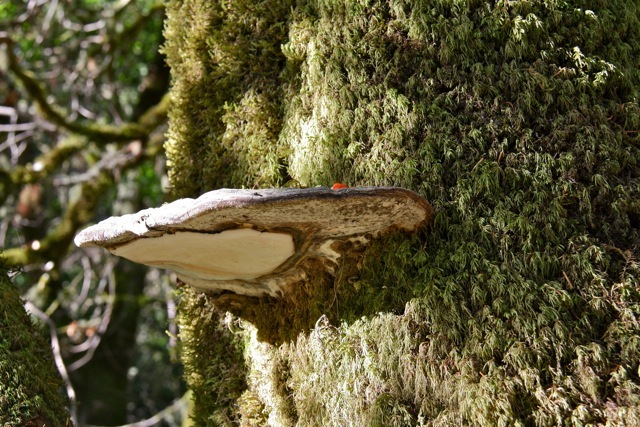 A sturdy, round shelf seems to be hung from the mossy trunk of a pepperwood tree. It’s brown and woody on top, with a creamy white surface below. You could set your drink on it, if you happened to have one with you while hiking. This charismatic fungi is an artists conk (Ganoderma applanatum), earning its name because if you scratch an image into its white underbelly, the depressed area immediately turns dark brown. This ready canvas is tough to resist–but any marks made are permanent, so it’s probably best to hold back and keep graffiti out of the woods. This woody fungus is in the polypore family. This group tends to be shelf-shaped and also lacks gills; instead spores are released from a minutely pored undersurface. There are a lot of different kinds of shelf fungi, but artists conks are fairly easy to identify. They grow on many different types of trees, but are particularly common on pepperwood (aka bay laurel).